Moka pots or stovetop took over the percolator as the most sought after coffee brewing machine in the common household. The principle behind the moka pot is similar to the percolator, but it takes a step up when it comes to design and output. The moka pot hails from Italy. After all, Italians know their coffee well and creating a machine that will yield good coffee is arguably second nature to them. In 1933, Luigi di Ponti invented the moka pot and commissioned a metal machinist, Alfonso Bialetti. Bialetti’s creation, known as the “Moka Express” rose to popularity and became one of the favorite brewers of the world. The moka pot is essentially a percolating device, but Bialetti noted that this machine causes boiling water to rise up, pass through the coffee grounds and out on the tube. There are no filters inside. The coffee grounds stay at the bottom of the pot. The construction of the aluminum moka pot set the standard in modern kitchens. What followed was the prominence of aluminum kitchen equipment that offered durability and convenience. To date, there are so many choices for moka pots. How can you choose the right one? Experts rounded up a handy checklist to use when choosing a stovetop espresso maker. As mentioned, Italians designed the first moka pot. Therefore, an Italian brand will come as a first choice. In fact, the Bialetti moka pots still reign as one of the best, if not the best, moka pot maker in the world today. Moka pots are known as a great alternative for espresso machine. This is hard not to believe since Italians love espresso. Choosing an espresso maker made from Italy will give you an idea that you can have quality espresso style coffee every time. If you choose otherwise, at least you have been warned. Check the volume of coffee that the stovetop can yield. Some models can make single serving, which is good enough if you are leaving alone or you are the only person in the house who loves coffee and espresso. But if you have a partner, entertaining guests frequently or a medium-sized family, get a stovetop maker that can accommodate at least 4 cups of coffee. This will be good enough for a small group. There are larger size stovetop espresso makers when really needed. Some stovetop makers require electric or induction stove. Always check this because it will be frustrating to take home a stovetop maker that will never work on your stove. Material used for the kettle body. Do you prefer aluminum or stainless steel? Aluminum is not as shiny and elegant as stainless steel, but it is more affordable and slower conductor of heat. Stainless steel is eye-catching but conducts heat fast so be careful when touching the handle. If you really want honest to goodness feedback, read reviews of the product you want and check praises and complaints about the stovetop espresso maker you are planning to buy. Aluminum vs stainless steel: which is better? There are no hard and fast rules between aluminum and stainless steel. Both are durable, sturdy and convenient to use. However, there are some differences that make people choose one over the other. Let’s take into consideration these factors. While both metal are durable and sturdy, aluminum is not as strong as stainless steel. However, stainless is heavier than aluminum. This is why airplanes are made from aluminum and not from stainless steel. This only means that stainless can be more durable than aluminum but expect that it is heavier. The component of stainless steel includes iron, chromium, nickel, manganese and copper. Chromium is a non-corroding agent that’s why stainless remain shiny and corrosion-free for years. Aluminum is subject to corrosion, especially when exposed to acidic environment. Coffee has natural acids, in time, this can affect the quality of aluminum moka pots. No doubt, aluminum heats faster than stainless. That’s why most of kitchen equipment are made from aluminum. Aluminum is cheaper than stainless steel. Aluminum is fairly soft and easier to cut and form. That’s why moka pots made from aluminum have different designs. On the other hand, stainless steel is harder. You will notice that most moka pots made from stainless have straightforward and round design. Aluminum moka pots tend to look old and worn out after several use. But stainless steel can remain sleek and elegant, when handled and taken care of well. Stainless is scratch and abrasion resistant so you can have your moka pots still looking new even if you have owned it for years. Stainless steel is less reactive with foods. On the other hand, aluminum can react to foods quickly and often affects the color and taste of food and drinks. 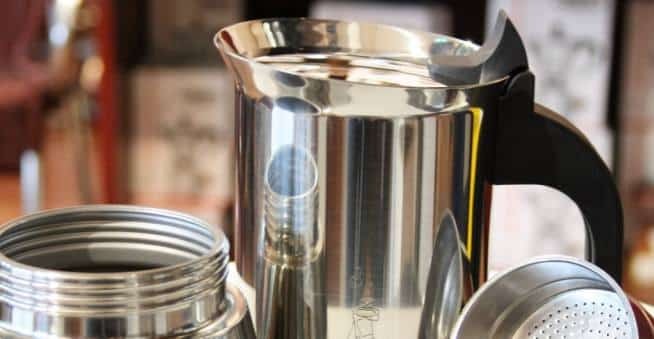 Aluminum and stainless moka pots have their pros and cons. Choosing between aluminum and steel will boil down to your preferences. At the end of the day, you need to decide which one will work best for you. If you are looking affordability, the obvious choice is an aluminum moka pot. It is really cheap. But if you are after value for money, you can safely invest in a nice stainless steel moka pot and use it for a longer period of time. If you are after for durability, go for a stainless moka pot. It is more durable and sturdy than aluminum. It can withstand corrosion and hard falls. If you are after food safety, stick to the stainless steel. Aluminum is known to corrode and if unnoticed, these particles can end up in your drink or food. There are studies showing that excessive ingestion of aluminum can pose health problems in the kidney, central nervous system and blood-related issues. According to H.J. Gitelman’s “Aluminum and Health: A Critical Review”, excessive consumption of aluminum has been linked to problems in the nervous system, causing listlessness and severe trembling. In another report, aluminum ingestion was linked to dementia and Alzheimer’s disease. While these are not conclusive, it sounds off alarm and health warning to people. However, other studies suggest that it may not always be the case since most aluminum-made equipment have protective layering.